In 1984, NBC stuck paydirt when the simple concept of “MTV Cops” became a smash success with Miami Vice. Sadly ABC didn’t have the same luck in 1983 when they turned “Tron Cop” into Automan. This might have been the weirdest cop show to ever escape a pitch session. Cop Rock looks like a safe bet concept when compared to Automan. Manimal seems more plausible. The show pushed TV special effects for a police procedural. When did S.W.A.T. get to transform their battle wagon into a helicopter? There’s a moment when watching Automan: The Complete Series where you ponder what drugs were the network executives taking when they green lit the show. And can we try them to get even more out of the Tron cop action? 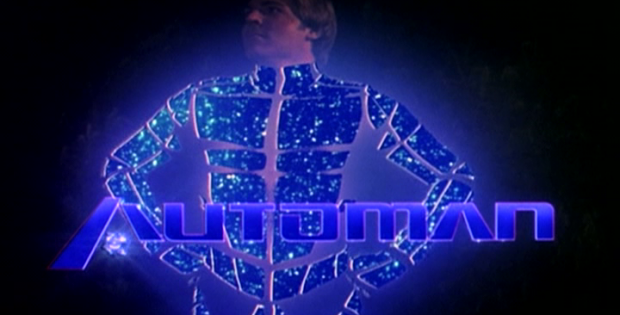 “Automan” is a 75 minute feature length pilot that introduces us to the greatest criminal fighting machine ever coded. Walter Nebicher (Here’s Lucy‘s Desi Arnaz, Jr.) is taken off street patrol and stuck in the computer division. He’s frustrated since he wants to be chasing down bad guys. Even worse is that barely any cops want to work with him because he’s a nerd. Lt. Jack Curtis (Robert Lansing) is the gruff old cop who doesn’t dumping off clues with Walter to see if there’s any connections found inside the computer. Walter is so bored that he creates a hologram program in a computer using the best elements of famous folks. He names his creation Automan (Chuck Wagner). What he doesn’t expect is that with enough power, the hologram can come outside the computer. This means he can only solve cases after dark since there’s not enough electricity in the grid during the work day. His first case involves scientists vanishing at the airport. Don Galloway (Ironside) is the first to go. Turns out some company in Switzerland run by Patrick Macnee (The Avengers) is ordering the kidnapping. The episode is star studded with Doug McClure (The Virginian) as a cop and Sid Haig (The Devil’s Rejects) as a biker. “Staying Alive While Running a High Flashdance Fever” pays tribute to the disco scene which had already died and become a nostalgia event by this time. “The Great Pretender” has Automan track down stolen paper from the Treasury Department. Another former Virginian, Clu Gulager moseys into the action. “Unreasonable Facsimile” involves a helicopter company covering up the crash of a police chopper. Delta Burke (Designing Women) has designs on Automan at a singles bar. “The Biggest Game in Town” has a computer genius messing with arcade games so they might kill the users if he doesn’t get his ransom. “Renegade Run” has Automan join a motorcycle gang to get the goods on a crooked Sheriff. Richard Anderson (The Six Million Dollar Man) appears in the show. This might be why a network executive thought Automan would be a hit. If America loved a half robot crimefighter, why wouldn’t they embrace a computer based cop? “Murder, Take One” has an actress busted for killing a gossip columnist. More important is the guest role from Peter Marshal after David Letterman killed his gig on The Hollywood Squares. Bart Braverman (Vega$) and Michelle Phillips (Mamas and the Papas) also have roles in the Hollywood revenge tale. “Zippers” has the hunky Automan going undercover in a male dance show. It’s not quite Magic Mike. “Club Ten” wrapped up the series with an episode that never aired originally about diamond smuggling. This is a shame the network denied viewers a gem. Automan: The Complete Series is another brilliant piece of WTF cop shows in the ’80s. Along with Manimal and Street Hawk (both also available from Shout! Factory), Automan did its best to liven up the cop show drama with a severe science fiction twist. The show works with the geek performance of Desi and Chuck’s sincere hunk appeal. The show entertains with the cyber weirdness escalating over the 13 episodes. The video is 1:33:1 full frame. The transfers look great since they bring out the Tron blue glow given to Automan’s outfit. The audio is Dolby Digital mono. You’ll hear all the computer noises. Calling Automan: The Auto Feature (42:00) is an indepth documentary about the series that includes interviews with the cast and Glen Larson. Wagner is still a good looking guy. Desi points out that while the show did well in the ratings, it was too expensive to produce for the network. The Story of Automan is how the press was told about this amazing concept of Tron cop. Feature Story is more from the original press kit. Original Cast and Crew Biographies are from the original press kit. Collectibles Gallery (2:24) is amazing with the amount of Automan toys that came out. They even have the Halloween costume even though the show didn’t ever air in an October. Stills Gallery (1:23) is various photos that promoted the show. Manimal Tailer (0:36) is a must get if you love Automan. Automan: The Complete Series revives another freakish cop show that didn’t quite become the next Knight Rider. This is an entertaining and addictive piece of weirdness.